The Mount Storm King trail intersection is a short walk from the Lake Crescent Lodge. The steep walk is a locals favorite for those living in Clallam County for generations. The path quickly rises from the valley floor to the mountains. The trail has several 'designations'. First gives you a short view of Lake Crescent. The second (pictured below) gives you a better view to the west and does not require use of aid. The third requires the hiker to pull themselves up using old ropes and light scrambling. Be sure you stay safe, whatever option you choose to hike. Bring lots of water, because there is none on the trail; after you start ascending away from Barnes Creek. Finish you hike with a dinner or lunch at Lake Crescent Lodge. I highly suggest sticking around for sunset by the lake. You will truly not be disappointed. 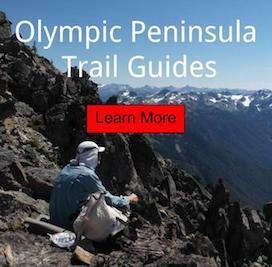 All the hikes in the area while visiting Olympic National Park can be access by using public transportation.